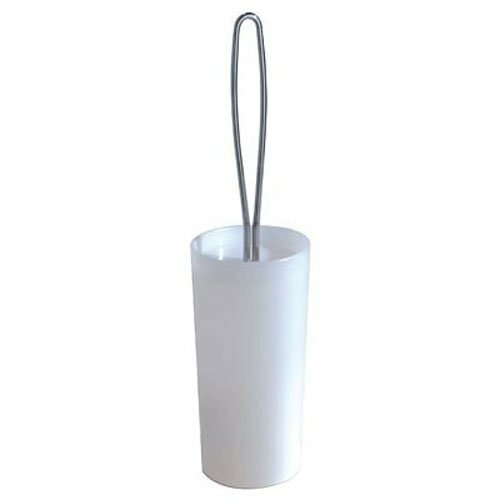 The simple lines and modern finish of this contemporary toilet bowl brush and holder will flatter any bathroom. The toilet brush cover is a tidy and organized way to store your bowl brush, discreetly concealing it with only the sleek, looped metal brush handle left on display above the holder. Perfect for compact bathrooms, the slimline brush holder can stand at the side of the toilet in even the smallest of spaces, and the bowl brush stays conveniently accessible for cleaning, while freeing up valuable storage space in the bathroom cabinet. Keeping you cleaning tools organized and tidy, the toilet bowl brush and holder are a great addition to busy bathrooms. InterDesign’s creative products enhance your décor, turning simple home solutions into must-have accessories that shine. Designed in the USA, we are proud to produce a wide selection of high quality home, bath and storage solutions that excite, inspire and charm. Stylish, functional and affordable, our products have been enriching customers’ homes for over 40 years. InterDesign: innovative products, exceptional value. SIMPLE DESIGN: Attractive looped handle design - toilet brush and holder have a contemporary feel. CLEANER STORAGE: Clear bowl brush holder, made of hard wearing steel and tough plastic. TIDY & DISCREET: Attractive clear canister covers toilet bowl brush - hidden bathroom storage. TIGHT SPACES: Compact brush holder is perfect for small bathrooms, measures 4" diameter x 16.4". THE INTERDESIGN PROMISE: Bringing you stylish, affordable home products for over 40 years. Unger Professional HydroPower Soft Brush with Squeegee, 10"
Unger Exhaust Vent Brush, 36"